This is a run down of common problems with coating, burning, washing out and reclaiming silk screens for printing. Problem 1. The emulsion does not go onto the screen smoothly and evenly. A. The mesh may have loosened up and have uneven tension. This is especially a problem with wood frame screens once they start to get old. B. Your emulsion may be old or have dried bits that have fallen into it. Keep the emulsion container clean and try to refrigerate it if you are not going to use it up pretty quickly. Check the shelf life of the emulsion you are using. C. Have you remembered to remove the rubber edge protector on your scoop coater? Don't laugh! You’d be surprised how many people make this mistake. Problem 2. Emulsion is washing out all over the screen. A. The screen was not exposed for a long enough time. You may have to experiment to get the right exposure time for your equipment and screen. B. The emulsion was applied too thickly on the screen and not exposed long enough to overcome the thickness. C. The emulsion may have been applied unevenly. The thicker patches may wash out and the thinner areas may be ok. If the emulsion is applied unevenly the thicker areas take longer to expose than the thinner areas, so you won’t get a good exposure on the screen. D. The lights in your exposure unit may be getting old and losing their potency. E. The emulsion was not cured. Make sure you allow enough time for the emulsion to dry completely and cure in the screen. F. Too much water pressure can cause the emulsion to wash out and you should only use cold or lukewarm water. Problem 3. It’s hard to wash out the image on a screen you just burned. A. The emulsion on the screen could be old. When a screen has been coated and sits around too long, the emulsion gets harder to wash out. B. The screen may have been exposed to some UV light. If there’s been too much light exposure to the screen the image area could be partially exposed and hard to wash out or may wash out unevenly. C. Your image on the transparency may not be solid black. If the transparency lets light through the image area can become slightly exposed. It’s possible to double your transparencies, just be sure to line both copies up carefully. Problem 4. Losing fine detail when you burn screens. A. The transparency may not be making good contact with the screen. Make sure you place the transparency with the print side next to the screen and weight it well enough to make good contact. A vacuum exposure unit is best, but if you don’t have one of these you have to be more careful. B. The screen is over-exposed. If the exposure is too long, the fine detail will not wash out and will be lost. C. The light you are using to expose the screen is not angled correctly. The light source needs to be as straight on as possible, in other words, 90 degrees to the screen. D. The light source may be too weak. If you are using a weak light source and a long exposure there is more risk of ambient light or light scattering contaminating the exposure. Problem 5. Pinholes in the screen. A. The glass over the lights may be dirty or have dust on it. Same with the transparency. Be sure to clean the glass before you burn a screen and the transparency before you tape it onto the screen. B. Dust or dirt could have blown onto the screen while the emulsion was wet. C. The emulsion may not have been completely cured. D. If you do get pinholes and they aren’t too big, you can either cover them with tape or you can use a screen touchup pen or fill them in with a little more emulsion and let it dry and expose it to UV light to harden it. Problem 6. 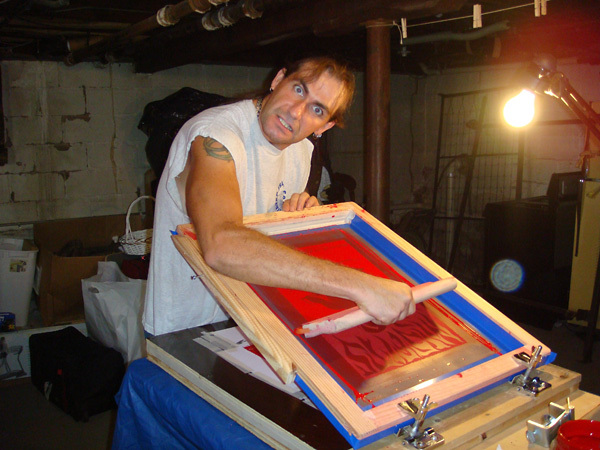 The emulsion breaks down while you are screen printing. A. The emulsion may not have been exposed long enough. We expose the finished screens to UV light after they are burned and washed out and have dried. Either with sun light or placing the screen back onto the light unit. B. The emulsion is applied too thinly on the screen. The emulsion should be thin and even, but coated at least once on each side with a good scoop coater. C. The emulsion may not have been properly cured. We usually allow a minimum of 24 hours for a screen to dry. D. Wrong type of ink for the emulsion you are using. We use dual cure emulsion that works with both water-based and plastisol inks, but choose your emulsion carefully and check to make sure it works with the ink you intend to use. E. Too much squeegee pressure or screening too many prints can cause the squeegee to wear down the emulsion. Be sure to use the correct emulsion for the type of ink you are working with and coat the screen an extra time on the inside of the screen where the squeegee will make contact if you will be screening a large number of impressions. Problem 7. The screen is hard to reclaim. A. The emulsion on the screen may be old. The longer the emulsion sits on your screen, the harder it is to reclaim. B. The reclaiming solution dried in the screen. Once the reclaiming solution dries on the screen, it becomes permanent and ruins the screen. Always be careful to wet the screen before you apply the reclaimer, keep it wet and work the reclaimer around on the screen with a brush or scrubbie. C. The emulsion may be uneven. If the emulsion is thick in spots, like around the edges, it may be hard to get all of the emulsion out. Though if it’s only on the edges, it may not matter. D. You may not be using enough water pressure. Try using a pressure washer, a special hose like the one Victory Factory sells or even try a coin-op DIY car wash.
E. Ink may have dried in the screen. If the ink was not washed out thoroughly it may have dried in and blocked parts of the mesh. You can try a haze remover like Enviro Haze. But if the ink has really dried in there, the screen may be ruined. Here is a handy chart from Speedball that I found. 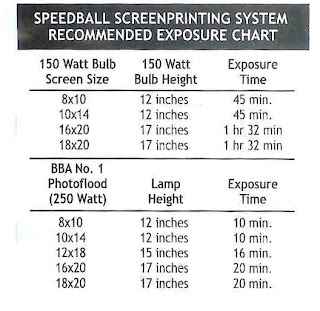 It may help with estimating exposure times if you are using light bulbs. i have a 200w bulb and expose 25 inches above my screens for about 35 minutes, works great. i let the emulsion dry for a couple hours, if it takes longer you may be coating it on too thick. good luck! and if you already solved the problem what have you found that works? how large are your screens - gray native - and what kind of emulsion are you using? @ xeep : You dont need 3 days to dry or 30 minutes to burn. You need halfn hour to dry and 1 - 1.30 minutes to burn aproximately. I faced the same problem as you, when I realized that my material supplier forgot to give me the sensitizer for the particular emulsion. Your must be a case like that. Go back to the shop and ask for details. I'm sure a photo sensitizer(whatever kind) is missing. I have a 25 Watts light...how many inches will it be from my screen and the light?? I checked my screen and looks great and also printed with it on cotton- no problem. When i finally printed on a softer fabric immage came out only partially even though i went over it several times. Cant tell if its a paint problem or fabric problem.